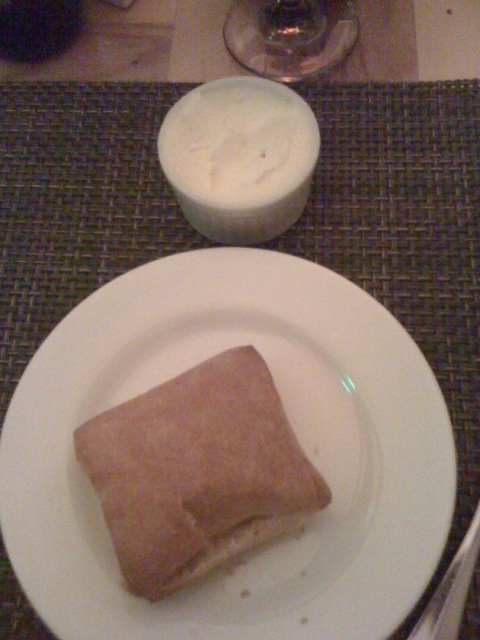 Bread: Small warm slices of white bread were served with a side of cold packaged butter. 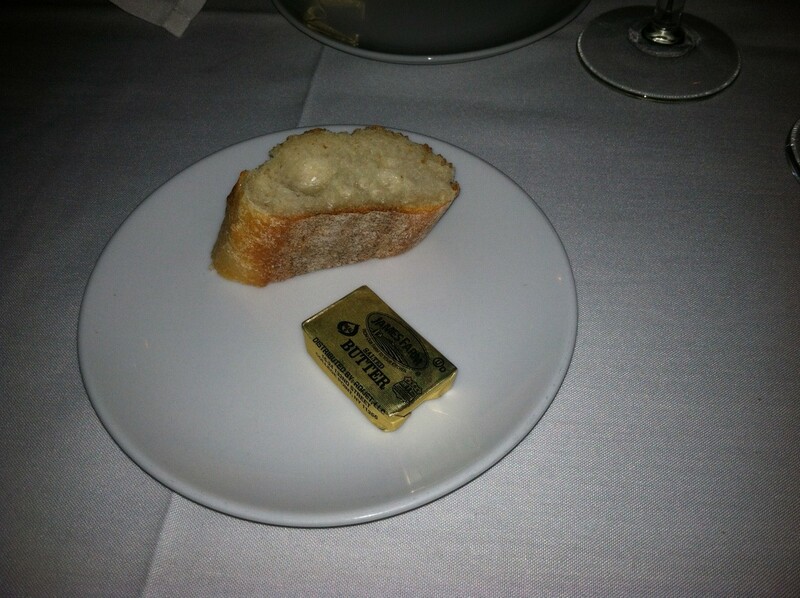 I dislike the butter situation but the bread was good, and butter is butter so I can’t really complain. Menu: Zuppe e Insalate, Antipasti, Pasta, Risotto, Entrees, Contorni. 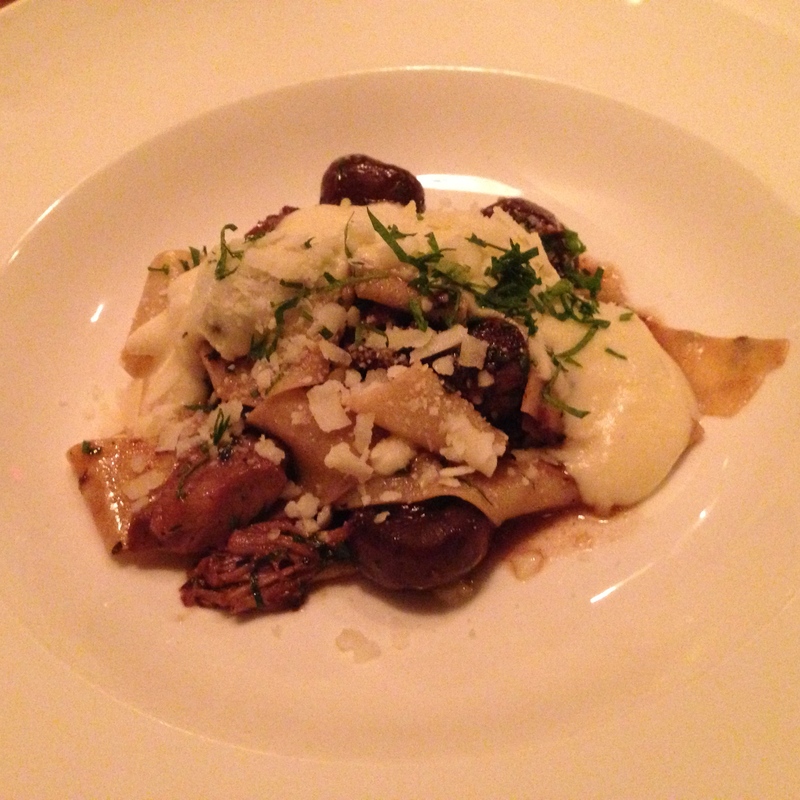 Each section was pretty extensive, offering classic dishes, an array of pasta types, and chicken, beef & veal entrees. I peeked at the menu that day but should have studied longer! There was a lot to choose from and I just couldn’t figure out what app and pasta combination to order. 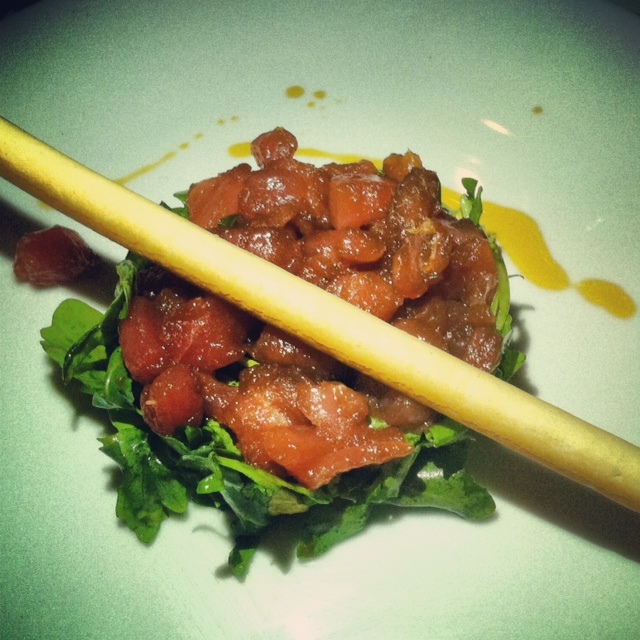 A pile of tuna covered a salad of arugula and avocado, and was topped with a breadstick. I liked that they gave you the components of an actual salad but the soy sauce was extremely overpowering in this dish. I finished it because the tuna was good but the flavoring was all wrong. It was between this and my favorite pasta dish (bolognese) but I’m glad I took a chance and tried something different. 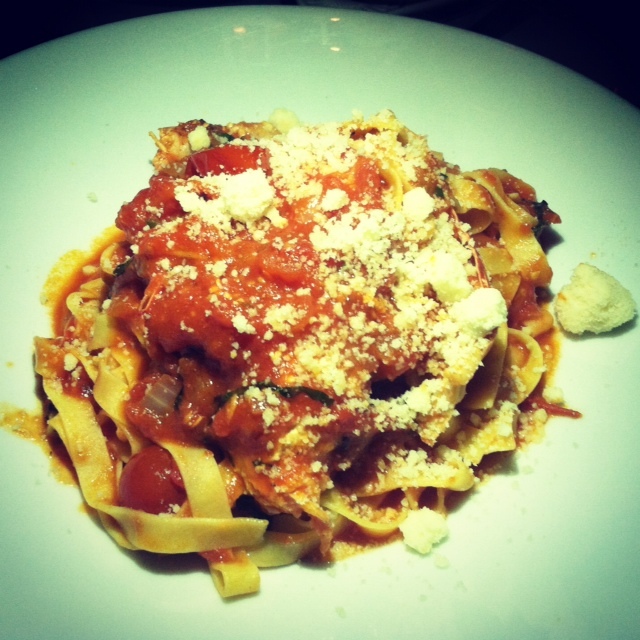 The mound of homemade tagliatelle was mixed with tomatoes, basil, and ½ of a lobster tail. My only complaint about the meal is that the lobster was still in the shell and it was a bit of a struggle to get it out. Other than that, the pasta was excellent with a small kick in the sauce, and there was a perfect amount of lobster. 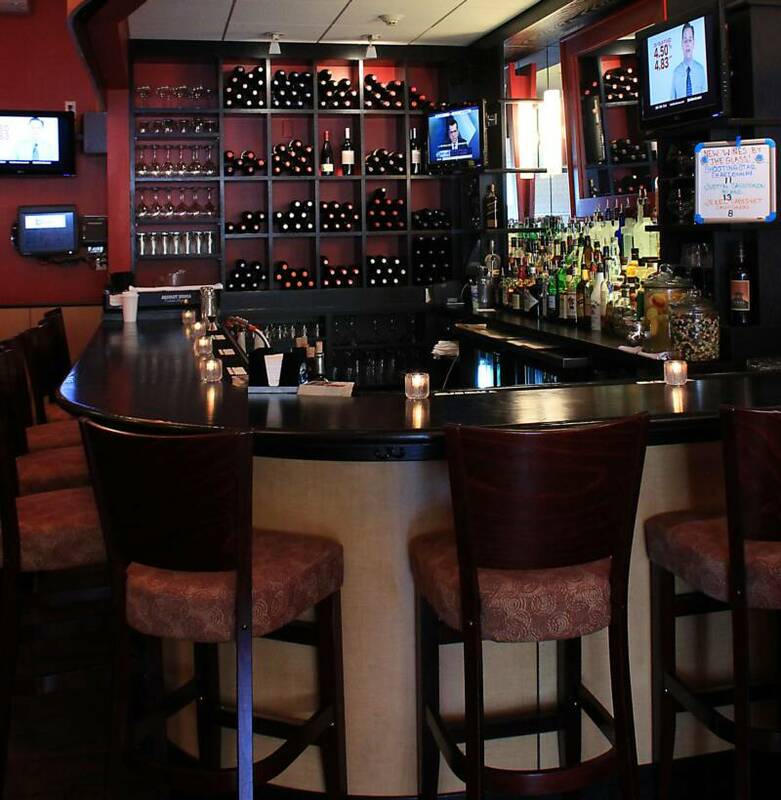 Service: Our server was great, everything came in a timely manner, and he checked on us often. When I asked if they served ½ portions of pasta the waiter looked at me like I was crazy… I guess he hasn’t eaten in Boston recently b/c that seems to be a possibility almost everywhere I go! 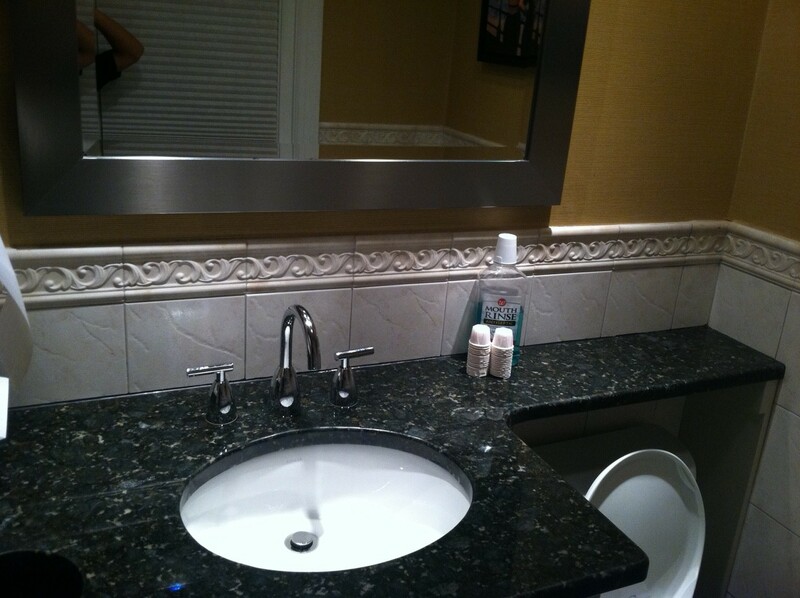 Restroom: A one room women’s room; clean, with a granite countertop and mouthwash! Overall: Walking into Tartofu you enter a square dining room with a long bar to the right slightly separate from the main area. We were sat at a low table behind the bar stools, up against the windows looking out into Newton Center. We really enjoyed our meals (minus the over soy-sauced tartar); both of our pasta entrees were excellent (Matt got the Fusilli Pesto) and there are many more I’d like to try. 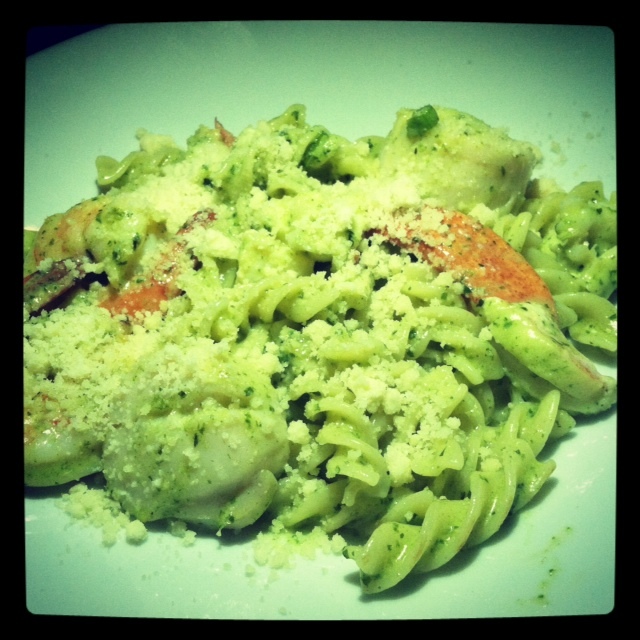 The pastas range from $15 to $29, with the more expensive dishes containing the most seafood. Prices are moderate, depending on what you’re ordering; salads and appetizers go from $9 to $16 while entrees are $19 to $35. 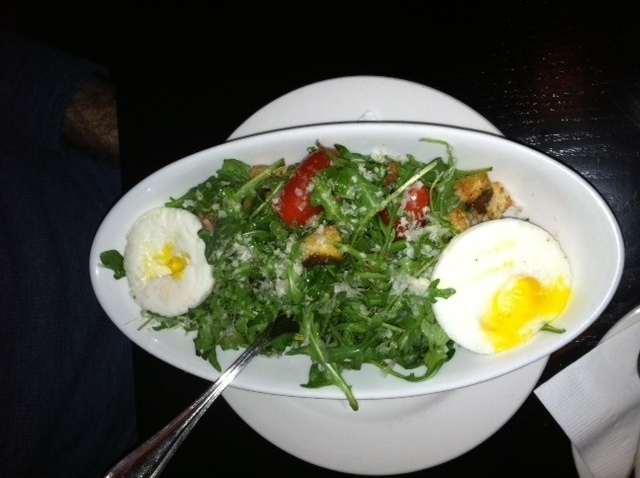 Overall, if you’re looking for a good Italian meal Tartufo will satisfy! The Perfect Bite: Tagliatelle, plum tomatoes, chunk of lobster tail. We tried B Street recently for brunch, and after drooling over the dinner menu I knew we’d be back soon. Bonus: B Street is on Restaurant.com which offered us a $50 gift card for $25. Small catch, you have to spend $100. But with this incredible menu that wasn’t a problem! 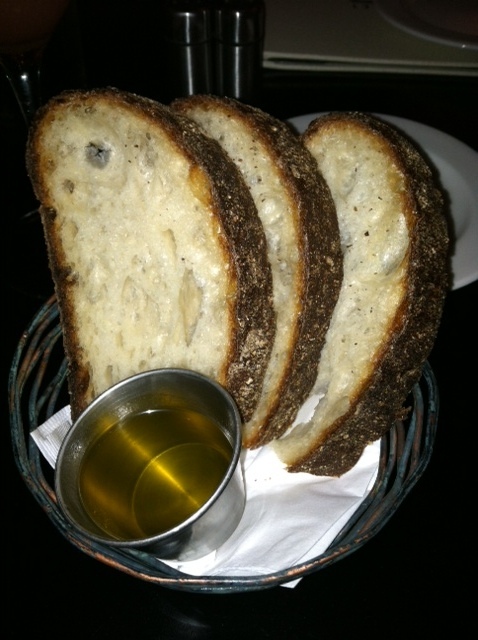 Bread: Three slices arrived for the 2 of us with a side of EVOO. When I saw the bread being delivered earlier I wasn’t too excited but it was actually better than it looked. The EVOO was plain which was a tad disappointing, but the bread was soft and filling. 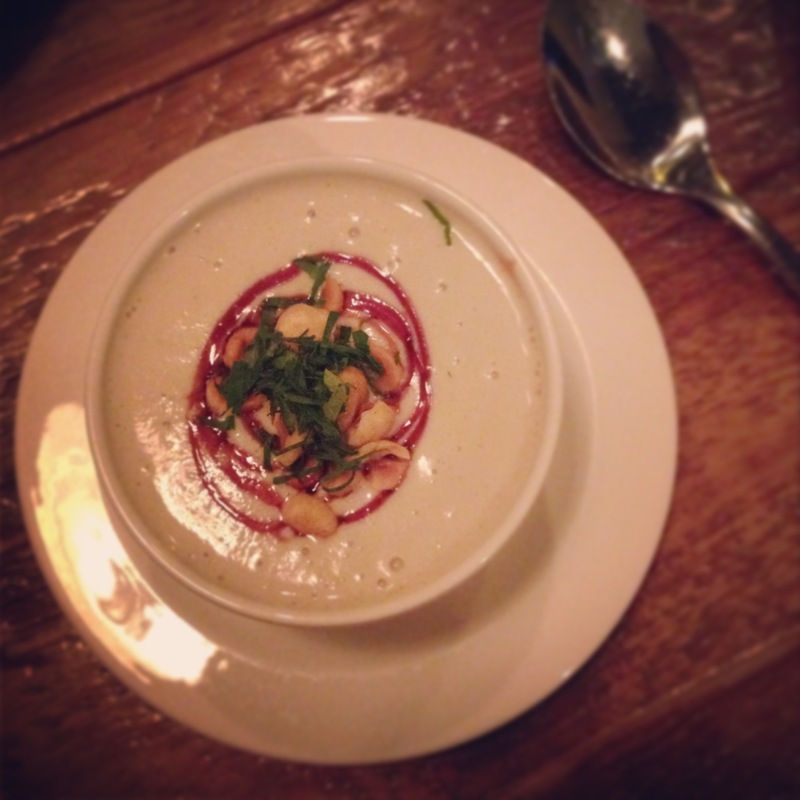 Menu: The winter menu features Soups & Salads, Starters, Entrees and Additions. It may sound simple but I’ve never been more overwhelmed with mouth-watering options! I wanted 4 out of the 6 Soups & Salads, 6 out of the 8 Starters, and just about every entrée had something special that was calling my name. 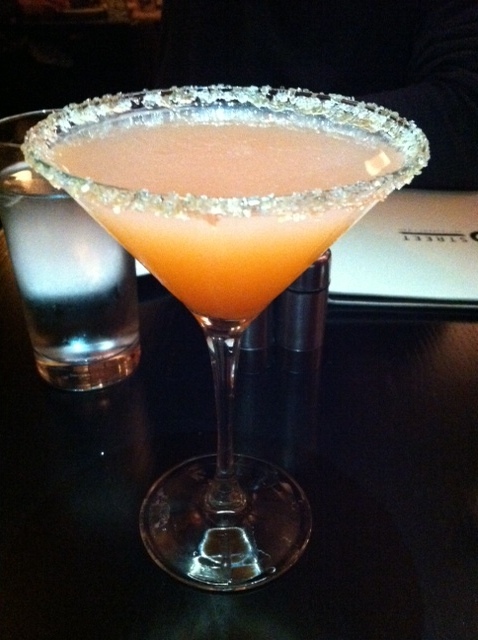 They also have a fun cocktail list, although only a couple caught my eye (like this Ruby Slipper). 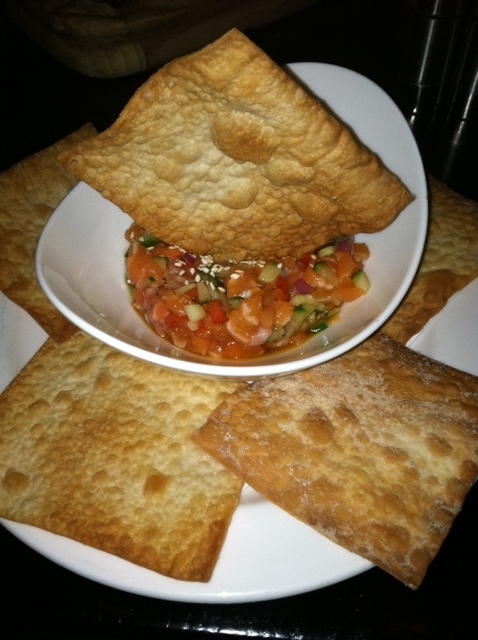 The tartar was cubed perfectly and I was happy to see it was salmon instead of the usually tuna. It didn’t appear to be that great of a portion at first, but it was more than enough for the 2 of us to share. No picture can do this justice! I love almost anything with fig, but pair it with duck & gorgonzola on a flatbread? Amazing! I would order this again in a heartbeat and urge you to try it ASAP. 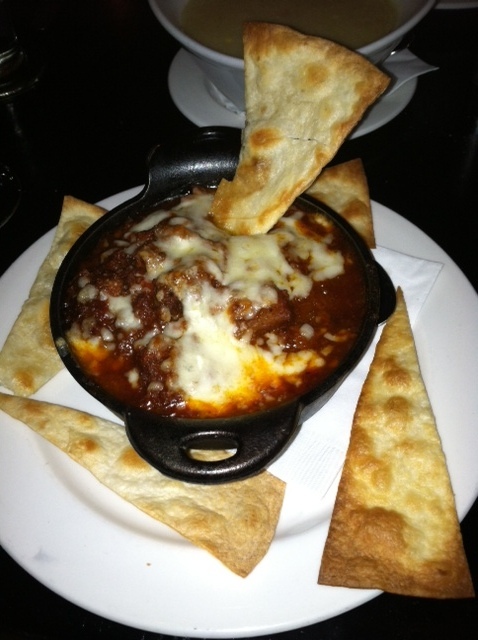 Served in a small cast iron bowl, the chili came topped with the melted cheese and tortilla chips. While there were plenty of pieces of squash, I was expecting more of a butternut squash flavor. 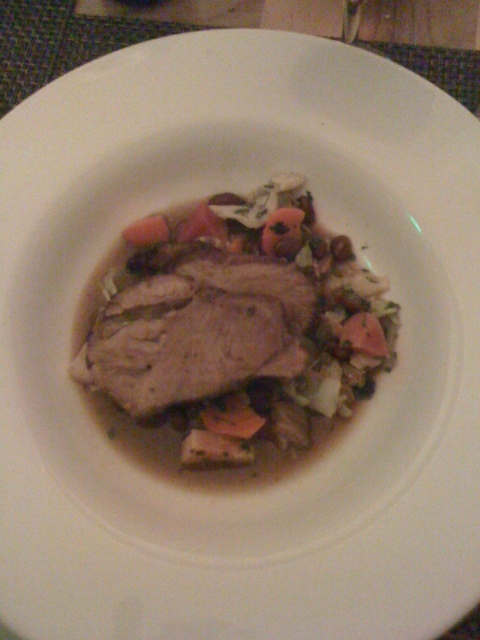 This dish was good & hearty, and I wouldn’t discourage you from trying it but it wasn’t my favorite of the evening. The soup consistency was in between a broth based and a thick puree. It was so delicious that I completely forgot about the lack of the polenta crouton (which I was truly looking forward to). I don’t love runny/poached eggs, but I tried a bite anyways. Not bad, but it wouldn’t personally be my first choice of salad. 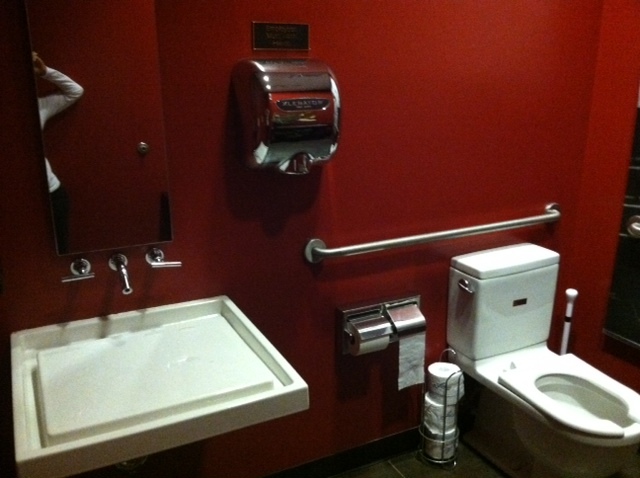 Bathroom: A 1 room/stall unisex bathroom. 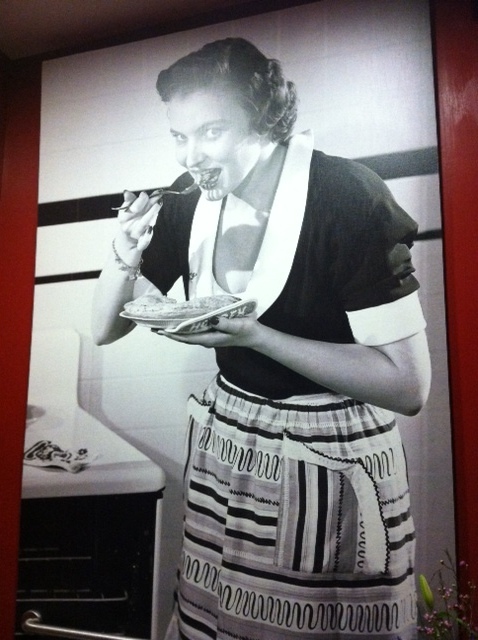 The bright red walls and square flat sink gave it a little edge, and I particularly liked the giant photo of a 1950’s housewife eating pie. Service: I don’t fully understand why restaurants don’t take reservations, which is probably my only issue with B Street. 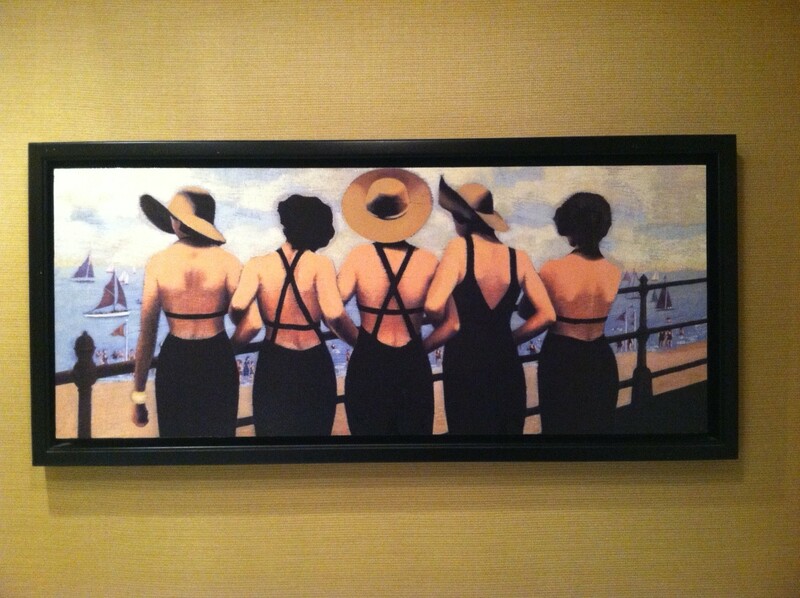 We waited about 20-30 mins in a cramped hallway, but the hostess checked on us a couple of times. Jackie was our server for brunch a couple of weekends ago and luckily for us we sat in her section again this evening. The place was jam-packed and she could have been understandably over-whelmed and frantic, but she was the opposite. She gave us plenty of time to enjoy our starters before we ordered our 2nd course. She was really friendly and I’ll be requesting her for our next visit. 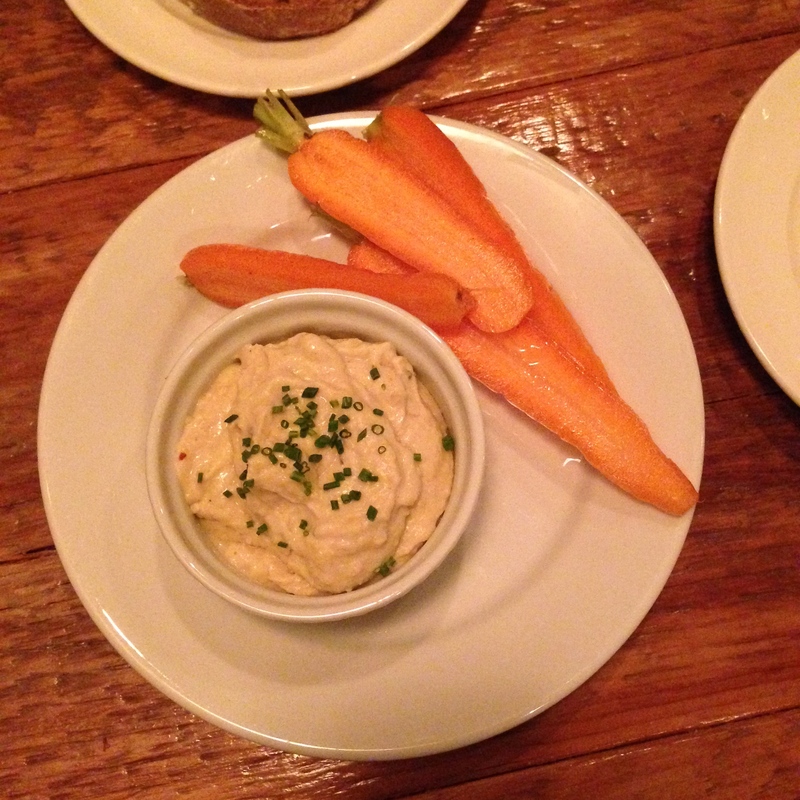 Overall: B Street is small in size but mighty in offerings and flavor! They have a cute bar and have optimized seating with some booths, banquettes, and high tops. The menu is outrageous in a ‘I want everything I see’ kind of way; the entrées really do sound excellent, but they can wait! The Winter Menu will only be around for another month or two, so I’m going back soon for the Braised Short Rib Quesadilla and the Pumpkin Hummus with Grilled Naan Bread. 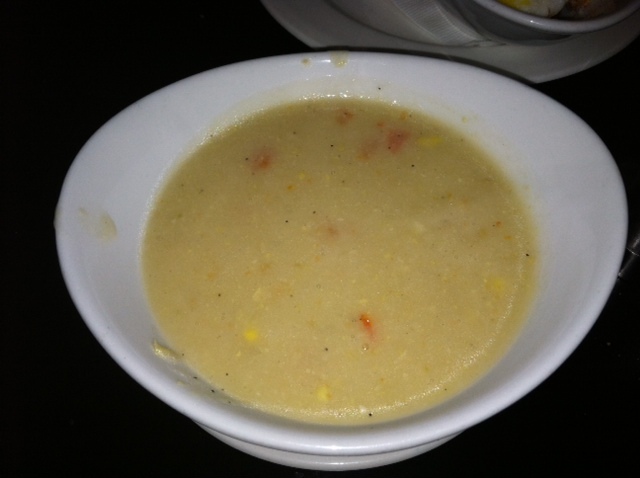 The Perfect Bite: I’m still dreaming about the Corn Bisque and the Flatbread. 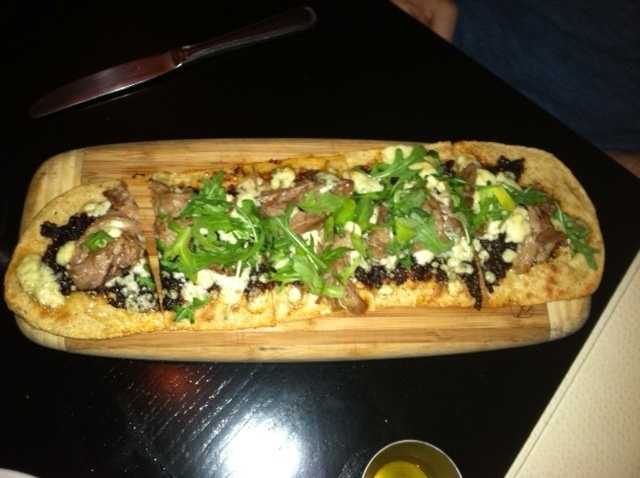 If I must choose… it has to be the Fig Jam & Duck Confit Flatbread with that strong Gorgonzola – amazing flavor! My winter Restaurant Week season began in Worcester with Ceres – I then repeated Sorellina because it was just too damn good last year, and my 3rd stop last night was Lumiere on Washington Street in Newton. I’ve heard great things, but I don’t venture towards Newton very often. This restaurant can easily be overlooked with its simple exterior and drawn curtains – after finding the location I realized I’ve passed by a few times in the past without noticing it. One of the first sites upon entering is a window behind the bar allowing diners to peer into their kitchen. I was hoping to be seated in a booth, but we were led up the ramp to the third room and sat at a table in the back corner. 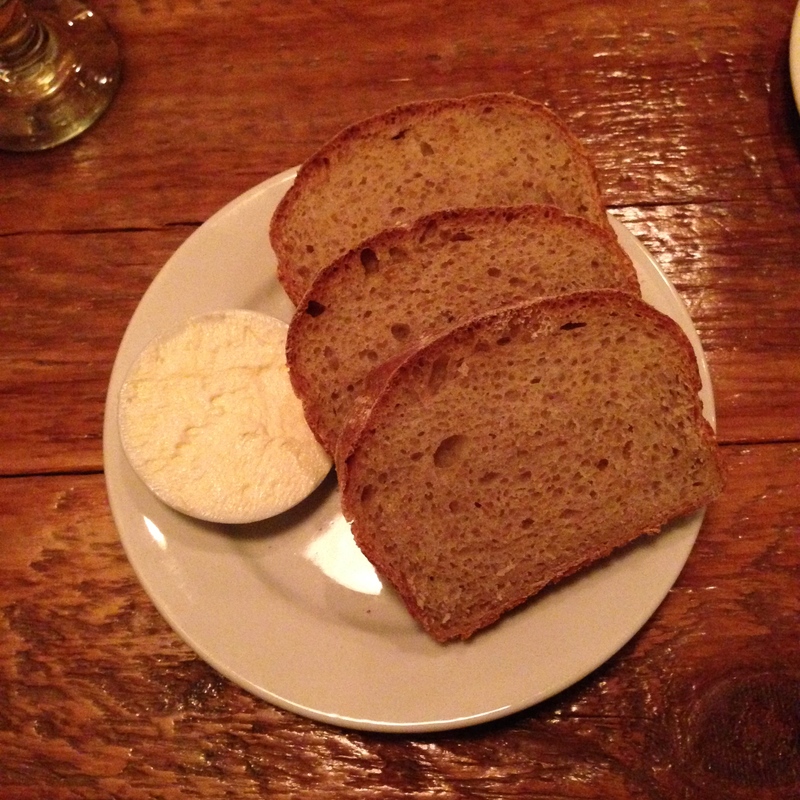 Bread: 4 square rolls were served in a metal basket with a full ramekin of butter. Warm bread + softened butter = perfection. I’m 95% certain the menu said this salad came with watermelon. 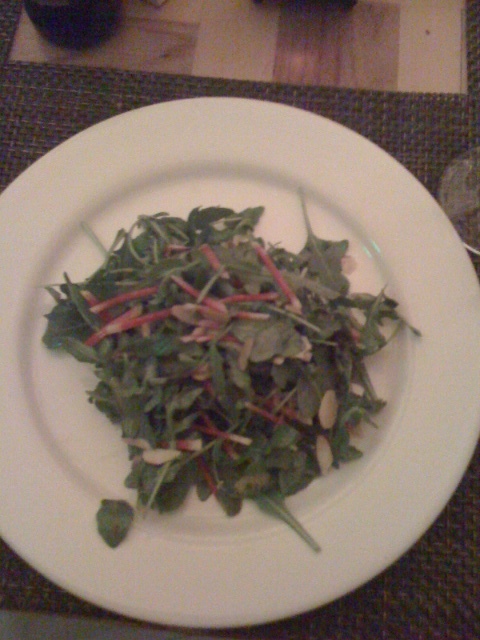 Since it’s not online I cannot confirm the contents of the salad, but I’m almost positive the thin red strips are radishes, not watermelon. Either way, I enjoyed the first course – perfect salad size, light dressing mixed in, and the accompaniments weren’t overwhelming. I don’t order pork often, so I don’t have much to compare it to, but what I can tell you is that I cleaned my plate (what else is new though?). The meat was cooked well, not too tough or dry. The vegetables were tasty but I sure was jealous of Sophie’s polenta – a small side of some starch would have perfected the entrée. The Chocolate-Peanut Butter Mousse almost swayed my decision, but I’m thankful I settled on this dessert. The tart was warm, surrounded by cider sauce and topped with a scoop of sorbet which was sweet and tasted more like creamy frozen yogurt. Bathroom: The door to the women’s room is marked “LADIES” with wooden letter blocks you might find in a pre-school. 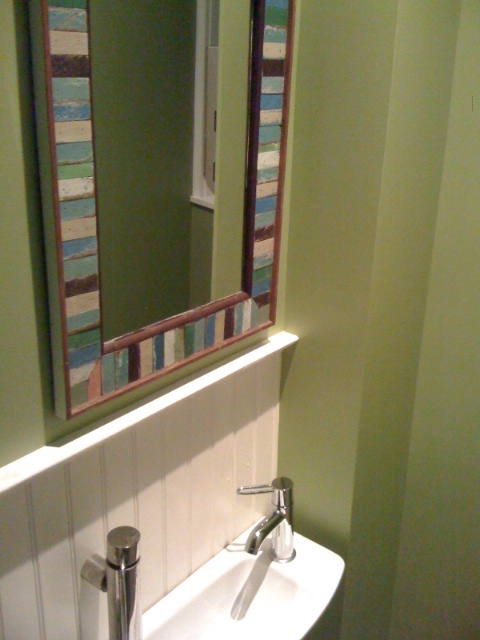 The inside is narrow and small but I liked the painted walls and tiled mirror. Wait Staff: The service was great – water glasses were refilled regularly, each course came in a reasonable amount of time, and while the waitress wasn’t overly excited or peppy, she still did a fine job. Overall: I always say it’s hard to judge a restaurant solely on a Restaurant Week visit so I would definitely head back to Lumiere. I enjoyed everything I ordered but I’d like to see what else they offer. The décor was minimal but crisp (white walls, white table cloths). I did like the design on the booth fabric and the chandeliers hanging in the bar area. 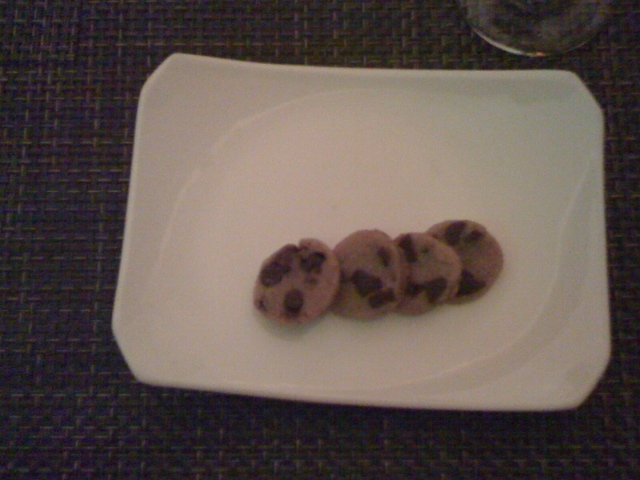 Points for the 4 bite sized chocolate chip cookies that came with the bill! 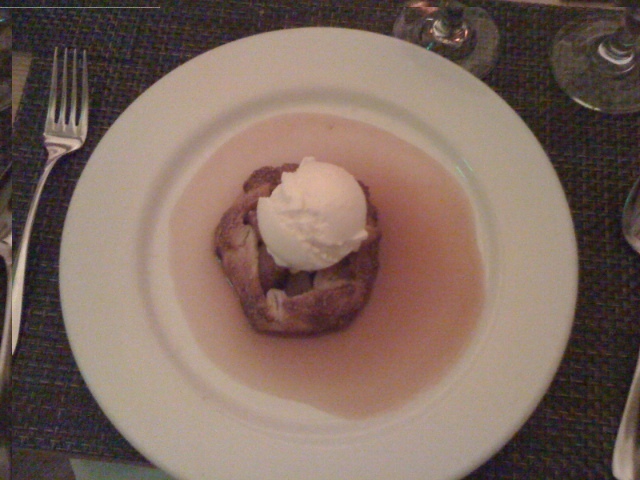 The Perfect Bite: Apple Tart, Sour Cream Sorbet. I’m not a sour cream girl, but this is a flavor worth trying.